Coming up with some interesting Cocker Spaniel names is as easy as diving a little deeper into the origins of the breed. 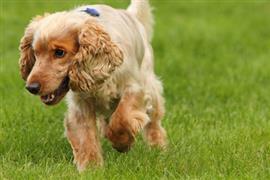 The word 'Cocker' in Cocker Spaniel comes from the breed's original use in hunting woodcocks. Scolo and Pax are a couple of ideas borrowed from the woodcock's genus. Dusky and Sula are names inspired by different species of woodcock. Billy, Bob, and Thornton are names taken from the actor who played the role of Woodcock in the movie ‘Mr. Woodcock’. Some famous people bearing the last name Woodcock include Eldred Nathaniel Woodcock (a hunter from Pennsylvania) and Robert Woodcock (a famous English musician). Obo is a good name with historic value. Both the English and American Cocker Spaniel are thought to be descendants of dogs named Obo (Obo and his son Obo II). The oboe is a similarly pronounced musical instrument. Other wind instruments provide names like Clarinet, Cornet, Dulcian, Kaval, Reed, and Willow. Some of our pages will contain a subcategory. A subcategory is a slightly more specific grouping than the main topic of the page. For a subcategory, we will include a separated table of names and corresponding descriptions. An example of a subcategory of Red Dog Names would be 'Dog Names Inspired by Red Wines'. If you have any subcategory ideas for the Cocker Spaniel Names page, we would love to hear them. Use the form below to submit your ideas.